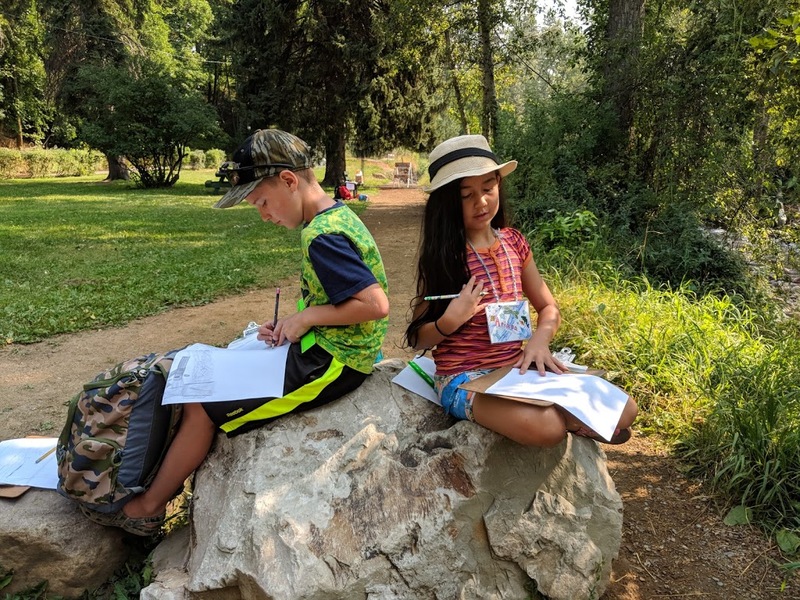 The 2018 Rattlesnake Creek Discovery Summer Camp, in partnership with the Missoula International School, was a full week of fun, play, and learning. Six children attended Monday-Friday 9 a.m.-3 p.m. On the first day, the Rattlesnake Creek explorers collected macro-invertebrates from two different locations, then learned how to identify and draw these aquatic insects. Tuesday was introduction to bug anatomy, and more exploration north of the Pavilion. 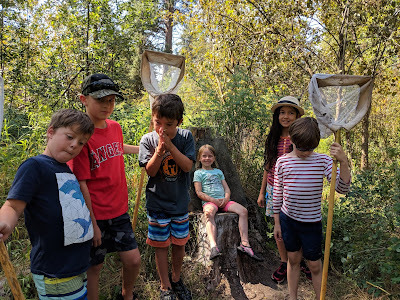 The explorers ventured off into the riparian area along Rattlesnake Creek and discovered interesting critters. The day ended with a cool down in the creek! 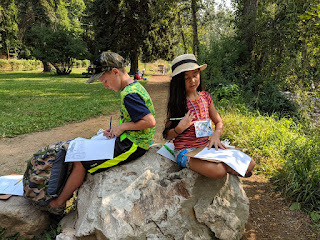 On day three, we mapped Rattlesnake Creek and created our own maps of Greenough Park. We also measured the velocity of the Creek with our sticks and painted rocks with Pam Ward (our guest instructor from Sussex School). Lastly, we rounded out the day with Bull trout game fun! Thursday we did a water cycle game and journaled about being a water drop. Cas Smith (our hydro-geologist guest presenter) taught a lesson on groundwater, which included exploring various wells in Greenough Park. The afternoon concluded with watercolor painting and Lego building. 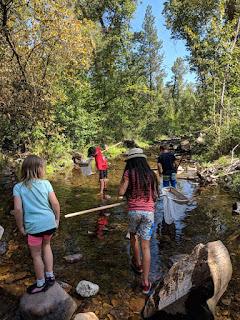 On our last day, the children collected sticks as we hiked and explored through Greenough, and then we used those sticks to construct “dreamboats”. Afterwards, we launched our boats down the Creek. 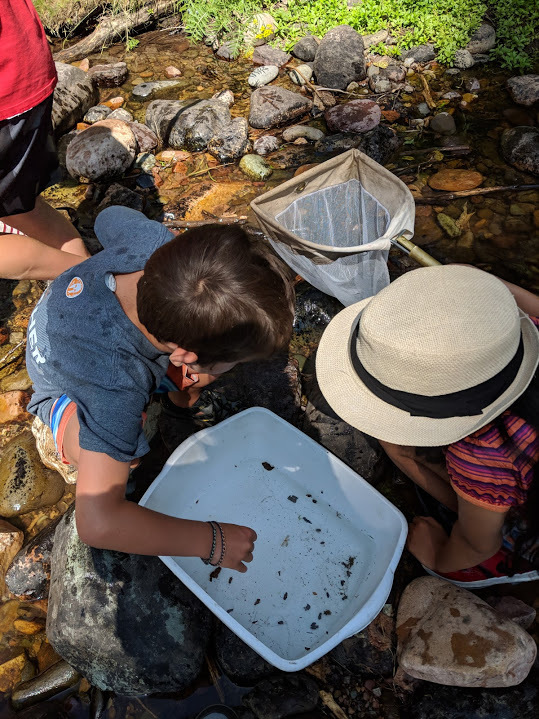 Finally, we celebrated this special week-long summer camp with a macro-invertebrate mayhem game, and said farewell to the Rattlesnake Creek. As the partner of an ex-river guide, I've heard (and fallen in love with) a phrase that seems to capture the spirit of this camp, "Let's just read and run." Read the river, then run it accordingly. While developing the Rattlesnake Creek Explorations Camp, we built a structured schedule which we followed every morning. I was an afternoon volunteer and witnessed firsthand how the overall mood vacillated in the full-belly, post-lunch afternoon heat. The children would either rally energetically after a quick dip in the creek, or feel lethargic. It seemed that they fed off of each other's energy, without any verbal communication. It was so fun to read them, and then help steer the afternoon schedule according to their wants and needs. We had so much fun every afternoon. Whether we were taking a break from the heat and painting rocks inside an MIS classroom, focusing on a groundwater lesson, or playing with spray-bottles at the Greenough playground- this camp was totally kid-centric. It was so fulfilling to help facilitate the creation of positive summer memories for these six, very awesome kids. This camp couldn't have happened without the leaders from the Missoula International School and Watershed Education Network: John Walker and Deb Fassnacht. Special thanks to our guest instructors Pam Ward and Cas Smith! 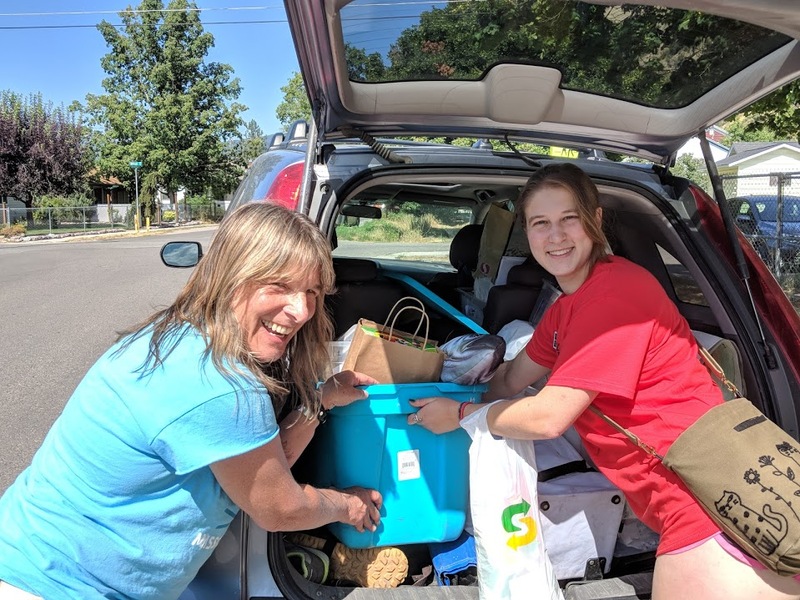 Shout-out to our volunteers: Madeline Wilber, Cassie Sevigny, Markus Boyer, and Eli Santos. I look back on this summer camp fondly, and consider it a huge success. We at WEN are looking forward to Summer 2019, and the possibility of offering more camps like this. Thanks for reading, and happy first day of Fall! Katrina is a part-time Communications Coordinator who is focusing on becoming a 'Jane of All Trades' in life, and for WEN. 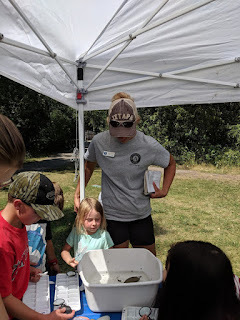 She assists with program development, and has worked on projects for YCC, AIS, and School Stream Monitoring. 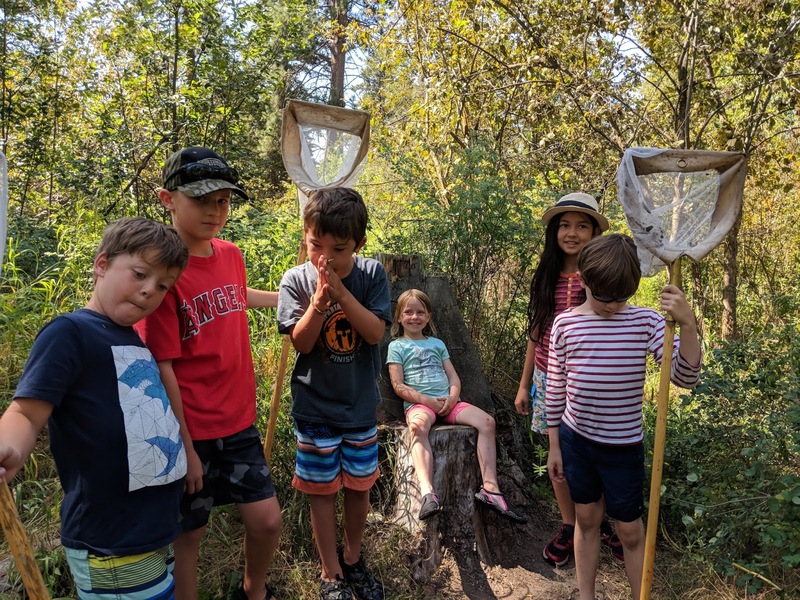 One of Katrina's life goals is to continue nurturing a community of outdoor learning in the region.